File Types: EPS,PNG,All Files; File Size: 30.07 MB; Layered: Yes; Vector: Yes. 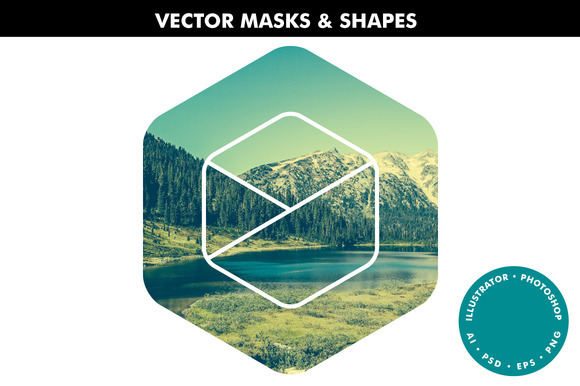 A collection of vector image masks and shapes for Adobe Photoshop and Illustrator. The masks work really well to present photographs and artwork in creative ways such as prints, t-shirts, exhibition graphics and other designs. Combine the shapes with the masks to create the appearance of segmented areas or incorporate them separately in your projects. Ideal for logo and merchandise designs. Each item can be used individually or in combinations to achieve interesting results. - Each item is on a separate layer. - Simply place your photo or artwork on the bottom layer and select which layers you want to use by toggling the layers on or off. - Simply place your photo or artwork on the bottom layer and select which items you want to use by toggling the layers on or off. - Each item is a vector shape layer so they can also be edited. - Change the colours, scale them to different sizes, add or subtract elements and combine layers for different effects. 03. Illustrator 8.0 EPS files fully editable and scaleable vectors. - 3 grid overlay effects 04. Transparent PNG files high resolution 300dpi / 420 x 420mm. - Supplied as a simple JPEG file which you can view here http://bit.ly/vms_ref Requirements. - The Photoshop document requires version 6.0 or above and a basic knowledge of working with layers and vector shapes. - The Illustrator document requires version 8.0 or above and a basic knowledge of working with layers. - The Illustrator 8.0 EPS files can be fully edited with any vector application that supports them or opened in bitmap applications that supports rasterising the EPS format. - The transparent PNG files can be edited with any application that supports them. Please note that none of the photographs, fonts or mockups shown in the screen shots are included. These are for visual demonstration of the type of effects you can create using the items in this collection. Keywords: vector, image, photo, masks, photoshop, illustrator, effects, clean, shapes, geometric, lines, grid, overlay, presentation, screen, print, frames, mockup, abstract, hexagon, circle, triangle, oblong, square, segments, divisions.